Sat., Sept. 22, 2018, 10:50 p.m. It was one of those conversations that meant more and more to me as I grew older. About 15 years ago, I was talking with a longtime newspaper executive whom I really respected. He was a former editor who worked his way up and through many newsrooms across the country to eventually get to lead his own paper. He was smart and practical and funny. He cussed a little too much, which I kind of liked. There was a lot to be learned from him and I wasn’t going to waste the chance to ask about the things you can only learn by working at all levels of a newspaper over several decades. There was this one thing he said – almost in passing – that made a big impression. He explained how newspapers meant different things to different people. Most might glance at the front page to look at a few of the headlines or the biggest photo, but few actually started their morning reading routine by focusing on the stories the editors deemed the most important of the day. Most people were going to start with the part of the paper they found personally the most interesting. And that was different for everyone, he said. Some would go straight to the local news section. Others not only started with sports, but specifically the box scores. Some might look at the national news or possibly the business section. Obituaries, letters to the editor, the comics, the weather forecast, the grocery store ads, even the horoscope might all be the most important part of the paper for different readers, he explained. There was one thing he said you could never mess up. He cautiously warned it was an easy thing to screw up because it was a part of the newspaper that seemingly shows up automagically each day, probably done by crafty little Keebler elves with ink-stained hands when no one in the newsroom was looking. It made me giggle, but I also suspected he was more right than wrong. Fast forward to my first winter in Spokane. It was late January 2017. I learned quickly what qualified as plowing the roads after a big snow looked very different here than, say, every other cold-weather city in the nation. But that’s a topic for another day. The Spokesman-Review’s features editor Carolyn Lamberson came over to my desk to tell me we were going to need to make a quick change to our daily crossword puzzle because the creator of the one we used had suddenly fallen ill and would no longer be producing one for newspapers. She said we had a temporary replacement that would fit the same space as the old puzzle and that we could get feedback from our readers in the early spring on a more permanent replacement. It definitely sounded both reasonable and practical to me. The next day, I quickly learned our newsroom’s voicemail system can hold 80 messages at a time. And all 80 of the messages on my desk phone were about one thing, with most callers using varying degrees of colorful language. That brings up another important point: I’m much more comfortable with the sheriff or the mayor or the CEO of a big local business calling me angrily first thing in the morning than I am one of our subscribers yelling at me to start my day – especially a reader who sounds like my grandma. I don’t care who you are, no one wants to let their grandma down. Nearly every message began by telling me how many years they had subscribed to our newspaper. The numbers were impressive on a whole bunch of levels. Then some might say they liked a few of the changes I’d made to the paper during my time in Spokane. But after a few pleasantries, they would explain that I had really screwed things up by changing the crossword puzzle. I called all of them back. I explained what had happened. Most believed me, but not all. My voicemail filled up a couple of more times that day and I continued to get calls about the change in our crossword puzzle for months. In April 2017, Wayne Robert Williams died at the age of 68. That was the man who made the crossword puzzle that ran in The Spokesman-Review for years. It appeared in about 65 other newspapers across the country. Around the time of his death, I got a phone call from a reader asking if we could please bring “the good puzzle back.” When I explained he had just recently died and we only stopped running his crossword in the first place because he quit making them due to his health issues, she asked if I thought we might be able to at least bring his puzzle back. Heck, the Peanuts comic strip still runs in many newspapers across the country and its creator, Charles M. Schulz, died in 2000. Even in The Spokesman-Review, we publish the Family Circus comic strip, which is now done by Jeff Keane after his father – original creator Bil Keane – died in 2011. So, her question wasn’t really crazy talk. And it explained exactly what that wise newspaperman was trying to tell me years ago: Don’t screw up the crossword puzzle. Never underestimate the little parts of a newspaper that many people cherish, even though they weren’t created by the local journalists in your newsroom. He knew people were almost irrationally passionate about the puzzles and some passions are best not messed with. And not even death is a good enough excuse. Well, today is the day we aim to make it up to you. Inside of today’s Spokesman-Review is a 24-page puzzles section. It is loaded with crossword puzzles, word searches, sudokus, wuzzles, mazes and even those crazy side-by-side images where you have to locate all of the differences in the two drawings. But there are some real treats in the section, as well. When I was at the Orange County Register, I wanted us to have a puzzle that was special to just our newspaper. Luckily, we knew of a Boy Genius in our area who was a crossword virtuoso. At 14, David Steinberg was just finishing Lakeside Middle School in Seattle when his first crossword was published by the New York Times, making him the then second-youngest constructor to be published during Will Shortz’s editorship. When we found out his family had moved into our area, we knew who to ask to do our puzzle in Orange County. Since that time, he has published more than 450 puzzles in the New York Times, the Los Angeles Times, the Wall Street Journal and many other major markets. 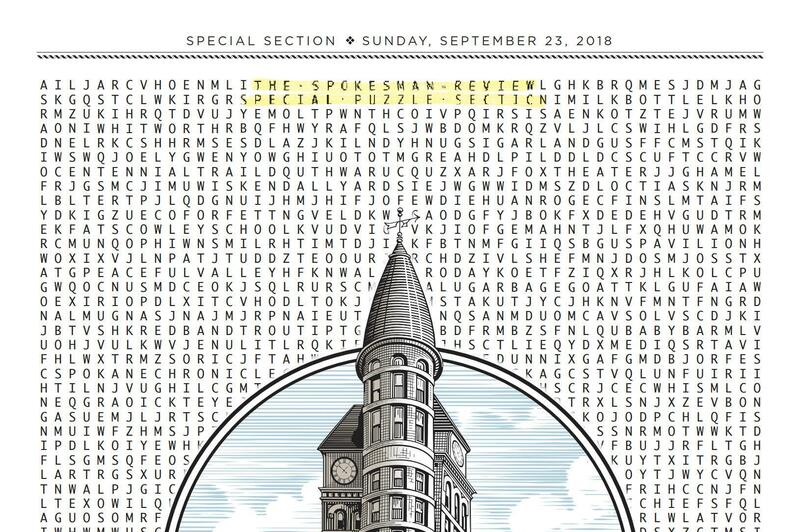 And as of today, he has now published a custom crossword puzzle for Spokane in The Spokesman-Review – which I’ll be looking for in his updated resume very soon. You can read more about David on Page 2 of our puzzles special section. More importantly, you can work through his Washington-themed puzzle. Then there’s the cover of the special section, which in itself is a puzzle. Spokesman-Review assistant managing editor for design Chris Soprych turned the entire front page of the section into a massive word search for the Spokane area. I may not be intimidated by local officials, roller coasters or 24-ounce energy drinks, but Chris’ puzzle scared the daylights out of me. Just looking at it makes me dizzy. I love when newspapers have moments of serendipity in them, something no one expected. Yet there’s another reason we wanted to do this special section. We wanted it to be like when we were kids and used to get the old Sears catalog in the months leading up to Christmas. Trying to decide what you might want Santa to bring you was almost as much fun as getting it. If you end up really liking any of these puzzles, we want you to reach out to us. Will we add them? Possibly. Depends on what kind of response they get from the most amount of our readers. The biggest thing is that we don’t want to screw up the crossword puzzle again. Published: Sept. 22, 2018, 10:50 p.m.